Same day total joint replacementMedicine evolves and moves fast. Few areas have evolved as quickly as total joint replacement surgery. In 2003, when Dr. Tim Talbert started private practice in orthopedic surgery, the goal for patients undergoing a total hip or knee joint replacement was discharge three days after their surgery. Many patients also required a discharge to an inpatient rehab facility for continued care. Thanks to exciting improvements in post-op pain management and advancements in surgical techniques, those days are quickly becoming distant history. 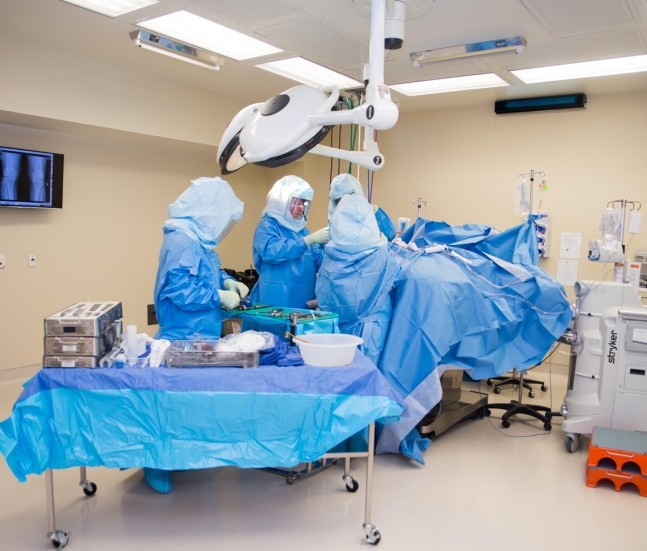 A surgery that once required a hospital stay of three or more days with rehab placement, now can be performed as day surgery. Patients are discharged to their home the same day as their hip or knee replacement surgery and are able to realize the benefits from an outpatient total joint experience. Improved Control of Post-Op Pain Management in Total Joint Replacements Advancements in controlling patients’ pain after their surgery has been one of the greatest contributors to the development of outpatient joint replacement programs. Before these advancements, the pain from hip or knee replacement was severe and required treatment with intravenous medications. These medications often left patients feeling drowsy and nauseated – which rendered them unable to participate in early mobility and physical therapy. Today’s approach to the control of patients’ pain after joint replacement surgery is comprehensive, and the results are remarkable. The approach used now includes the use of nerve blocks in combination with a variety of medications aimed at controlling pain. The nerve blocks provide a localized numbing effect which greatly reduces pain. Patients are more comfortable immediately following their surgery and experience the numbing effects from the blocks for up to 72 hours. These advancements in the management of pain allow for the patient to walk within one to two hours of joint replacement surgery and begin their physical therapy the same day. Improved Surgical Techniques Outpatient knee and hip surgery is also made possible because of improved surgical techniques. Surgical techniques for joint replacement have evolved to include: smaller incisions, less tissue disruption and different surgical areas of approach. All of these techniques were developed to minimize muscle trauma. Most surgical techniques now involve little or no disruption of the muscle, which minimizes pain and also allows for early mobility by the patient. Benefits of an Outpatient Total Joint Replacement Outpatient total joint replacement is exactly like traditional total joint replacement, except for a few differences in care after surgery. Patients are discharged to their home on theß same day as their surgery, allowing for a quicker and more comfortable recovery. Patients that have had both traditional inpatient total joint replacement surgery and now have had outpatient total joint replacement surgery have been very consistent in their opinion. Overwhelmingly, they are more satisfied with an outpatient total joint surgery experience. Patients report that having access to their home and personal surrounding immediately after surgery makes for a more comfortable and restful recovery. Does Everyone Qualify for an Outpatient Total Joint Replacement? Many patients are healthy enough to have total joint replacement via outpatient, same-day surgery. Preoperative screening is carried out to determine eligibility. Even if a patient does not qualify for outpatient total joint surgery, the same techniques and protocols discussed previously are now employed for traditional total joint surgery. Improved collaborative effort between the surgeon, anesthesia, physical therapy and nursing has allowed for a substantially reduced length of stay, with most inpatients discharged one to two days after surgery. Joint replacement surgery has been transformed over the last 20 years because of the great works by many disciplines in health care. Patients are benefiting from these advancements, which includes outpatient total joint replacement. Outpatient joint replacement surgery has been the right choice for many and may be the right choice for you. It will get you moving again … fast! Timothy W. Talbert, MD, specializes in orthopedics and sports medicine as well as adult joint reconstructive surgery. The Highland Clinic Orthopedics and Sports Medicine are pleased to offer outpatient total joint replacement surgery to qualifying patients and traditional total joint replacement. Drs. Tim Talbert, Craig Springmeyer or Carlton Houtz currently perform outpatient total joint replacement surgery. If you are considering a joint replacement procedure, please contact their office for a consultation.